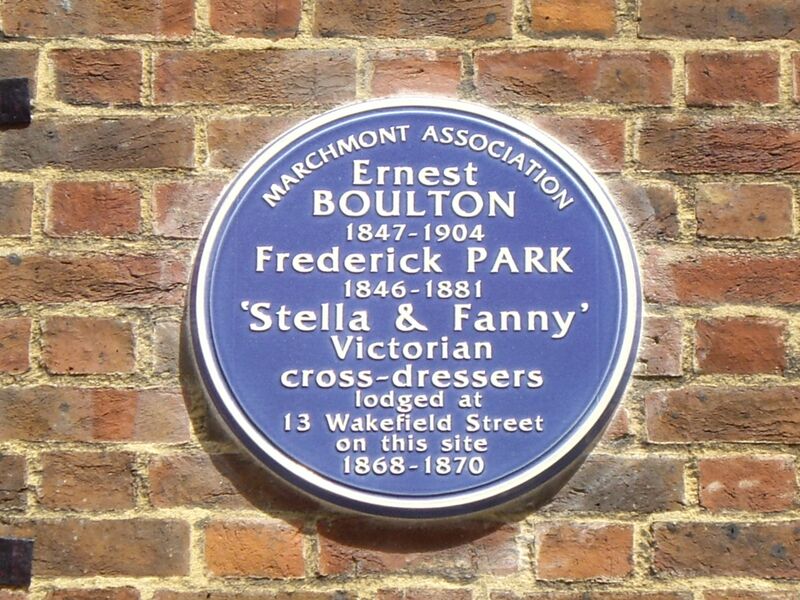 Following the unveiling of the plaque to Herzen (see it on open plaques) in Judd Street last month, the Marchmont Association have just installed another round the corner in Wakefield Street, commemorating the Victorian cross-dressers Boulton and Park, a.k.a. Stella and Fanny (open plaques entry). 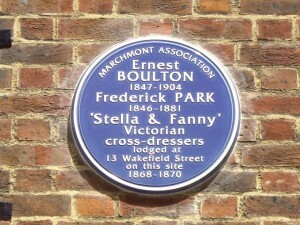 Plaque to Stella and Fanny, aka Ernest Boulton and Frederick Park, Wakefield Street, London W1. ‘Cross dressers’ is something of an under-statement. For not only did they drag up on stage but also in public; they were deeply involved in the homosexual subculture of Victorian London; and they were the defendants in a notorious trial that had the crowds flocking to the courtroom. And the prosecution couldn’t even show it was a criminal offence for men to drag up in public. In his brief overture to the unveiling Neil McKenna spoke of how the site itself had a larger part than just being the lodgings for Stella and Fanny. Now the headquarters of the United Reformed Church, 13 Wakefield Street had been a ‘house of accommodation’ for young men with a penchant for dressing up in women’s clothes. Consequently, there was quite a community based around it. Not a brothel as such, but not a legitimate lodging house either, it was run by Martha Stacey, probably a former prostitute, who knew what was going on and when to turn a blind eye to it. It was also the scene of the illegal police raid so criticized by the judge. So it’s not just these two men who are remembered by this plaque, but an SSSSI – a site of special sexual sub-cultural interest. This entry was posted in history, london and tagged c19, history, lgbt, london. Bookmark the permalink.